Over the last decade or so, kayaks have become incredibly popular with anglers. Fish finder manufacturers have taken notice, creating a category of kayak fish finders. The Garmin STRIKER 4 comes in as this year’s overall winner in the Best Kayak Fish Finder category, making it the best all-around choice for tech-savvy kayak anglers. Skip down to read more about the Garmin STRIKER 4. 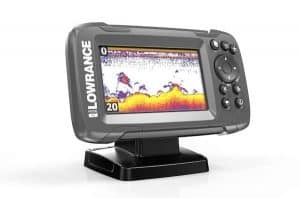 Deal-seeking kayak anglers interested in an impressive tech package at an affordable price should consider the Lowrance HOOK-4. Skip down to read more about the Lowrance HOOK-4. Kayak anglers with no cost constraints interested in the best technology package available should consider the Raymarine Dragonfly 4PRO. Skip down to read more about the Raymarine Dragonfly 4PRO. Kayak anglers interested in a well-balanced mix of rock-solid, no-fuss, no-muss technology should consider the Humminbird Fishin’ Buddy. Skip down to read more about the Humminbird Fishin’ Buddy. Kayak anglers with an eye for technological whiz-bang should consider the Deeper Smart Sonar PRO+. It’s no mystery why, as as they allow anglers easy access to favorite lakes, rivers and reservoirs without the headaches and expenses involved with traditional boats. In fact, kayaks are superior to traditional watercraft in a number of situations. Not only are kayaks easier to get on the water than traditional boats are, they also enable you to access many of the difficult-to-reach areas that often hold the most fish. But, just because you are in a kayak doesn’t mean you don’t need to see what’s going on below the water surface. You’ll still want to be able to locate major lake structures, vegetation and schools of fish, no matter what type of craft you pilot. You can do all of these things with a well engineered kayak fish finder, but you must be sure to select a model that will work well with your kayak, canoe or Jon Boat. Fishing from a kayak is quite a different pursuit than fishing from a traditional boat or the shore is. Accordingly, you’ll want to look for a kayak fish finder that’s well-suited for your boat, and – to the extent possible – include features specifically tailored to a kayak. Most fish finders that work well for kayaks are a bit on the small side. To ensure that you can see the information displayed easily, you’ll want to look for models that have high-quality screens with plenty of customization options. Even the most primitive and bare-bones sonar units will help you learn more about the things lurking under the surface, but the more information your fish finder collects the better. Some of the best fish finders provide scanning sonar capabilities, which provide much more detail than traditional sonar transducers can. Scanning sonar signals can be directed straight down below your boat (called down-imaging) or they can be projected to the sides of your boat (side-imaging). Down-imaging is generally more common, but some of the best fish finders provide side-imaging capabilities too. 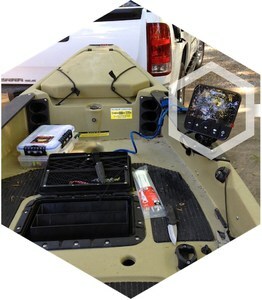 However, side-imaging capabilities are somewhat rare for a kayak fish finder. Although kayakers often fish in small lakes and rivers, and they rarely cover very long distances, GPS capabilities are still very helpful. For example, you can use the GPS feature on a fish finder to mark productive fishing spots, so that you can find and revisit them later. Many GPS-enabled fish finders will also display your traveling speed, which can be helpful too. Even if you are technologically savvy, you’ll still want a fish finder that is easy to set up and operate. You want to spend your time fishing, not messing around with your sonar unit. Fortunately, most modern fish finders have very clean and intuitive user interfaces, which will make it easy for you to concentrate on fishing. Most fish finders have some degree of water resistance, but because kayakers are more susceptible to spills, water resistance is an especially important feature to seek in a kayak fish finder. Some of the best units will even withstand being submerged for a short time without allowing water to seep into the internal electronics. Because anglers must often mount their kayak fish finder every time they head out on the water and pack it up after every trip, it is important to find a unit that is easy to install. All five of the fish finders in our review are pretty easy to install and operate and one of them (the Deeper Smart Sonar PRO+) doesn’t even need to be attached to your kayak at all. Manufacturers often include a number of bells and whistles in their kayak fish finder offerings, which can drastically increase the value of the unit. Some manufacturers have even developed proprietary technologies that will help you find and catch fish more effectively than you ever have. 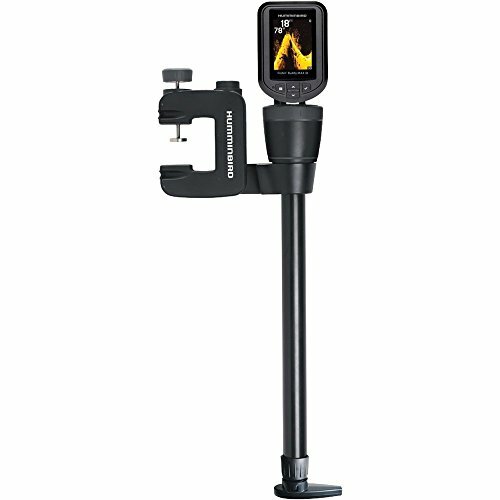 Proprietary Scanning Technology – Some fish finders utilize specially designed scanning technologies, such as Humminbird’s MEGA down- and side-imaging. These scanning technologies often outperform the traditional down- and side-imaging circuits in other fish finders, and they are well worth the additional expense. Map-Making Functionality – Because kayakers often fish small waters, it isn’t always possible to obtain maps or charts of your favorite fishing hole. However, some fish finders allow you to make your own custom maps, complete with bottom contours, vegetation and bottom composition. Touch-Screen Functionality – While most entry-level fish finders utilize physical buttons, a few provide touch-screen interfaces. There is nothing inherently superior about touch-screen functionality, and some anglers prefer traditional interfaces, but touch-screen fish finders are available for those who prefer them. Below, you’ll find our choices of five entrants into the kayak fish finder category. Be sure to select the model that will best fit your fishing needs and provides the features and characteristics that are most helpful for your unique circumstances. 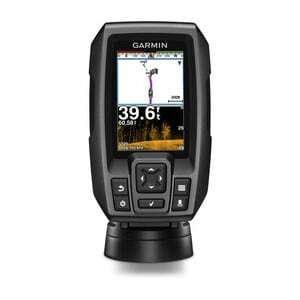 The Garmin STRIKER 4cv is an affordably priced, yet impressively equipped sonar unit. Coming in at less than half the price of many similar fish finders, the Garmin STRIKER 4cv deserves serious consideration from any angler interested in a kayak-friendly unit. The first thing most anglers will notice about the Garmin STRIKER 4cv is that it not only features CHIRP sonar capabilities, it also features CHIRP down-imaging technology (called ClearVu) to give you the best possible images of sunken ships, blowdowns, vegetation and more. And it is easy to see the information the included transducer collects, thanks to the 4-inch, full-color display screen. The Striker 4cv also provides split-screen functionality, which allows you to simultaneously view two different types of information. For example, you could set up one side of the screen to display information collected by the CHIRP sonar unit, while the other side of the screen displays your waypoint map. The STRIKER 4cv has an included GPS circuit, which allows you to mark productive locations, so you can easily find them again in the future. In fact, the GPS circuit even tells you your current speed. The STRIKER 4cv is also the perfect tool for ice fishing or vertically jigging, as it includes a built-in flasher unit. This lets you ignore everything except the bottom, your lure and the fish you are trying to catch. The Garmin is easily the best kayak fish finder option for those who like to fish in deep water, as it clearly images down to depths of 1,750 feet in freshwater or 830 feet in saltwater. For more detail, please read our complete Garmin STRIKER 4cv Review. 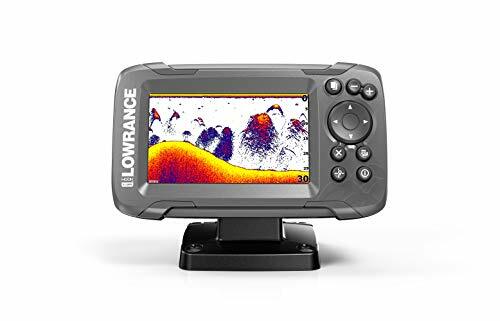 The Lowrance HOOK-4 is a feature-packed fish finder at an affordable price, which will make a great choice for most kayaking anglers. It is not only equipped with down-imaging sonar capabilities, but it also uses CHIRP sonar (which emits signals at a range of frequencies to provide the most detail possible). This information is displayed on a crystal-clear, full-color 4-inch screen, which provides several different customizable parameters, so you can adjust the display to suit your preferences and the current weather conditions. The screen can display a variety of different types of information, and it has a three-panel view mode, which enables you to view three different types of data at the same time. You can even scroll back using the trackback function to review locations and structure you’ve already passed. This ensures you’ll never have to circle around to get a better look at underwater points of interest. One of the nicest things about the HOOK-4 is its IPX7 water-resistance rating. Fish finders with this rating are not only protected from splash and spray, but they can even be submerged for up to 30 minutes in 1 meter of water without suffering harm. Particularly helpful for a kayak fish finder at times only inches from the water’s surface. The HOOK-4 is designed to have a very intuitive user interface, unlike some other fish finders, which will often take some time and effort to learn how to use. In fact, you can operate the HOOK-4 entirely with one hand, which means you won’t have to put down your rod to change views or adjust the unit’s parameters. For more detail, please read FishingTech’s complete Lowrance HOOK-4 Review. The Raymarine Dragonfly 4PRO is easily a leading kayak fish finder choice. Although no cheap at the high end of the range, the Dragonfly 4PRO comes with a variety of features that are more common from Raymarine’s higher-end fish finder lines. 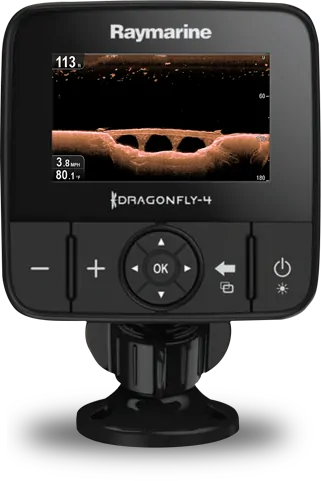 For example, the Dragonfly 4PRO not only comes with CHIRP Down Imaging, it also features a traditional (conical) CHIRP sonar channel. This combination gives you the best of all worlds and allows you to image the underwater world in two different ways. The Dragonfly 4PRO is also easy to connect to your smartphone or tablet, thanks to the Raymarine WiFish app. You can even take screenshots from the Dragonfly 4PRO and share them with your friends. Perhaps most impressively, the Dragonfly 4PRO features auto-adjusting sonar. This means that the image displayed on the screen will always be optimized for the best possible view given the conditions. This way, you’ll be able to concentrate on the fish, rather than having to wrestle with the settings on your fish finder. 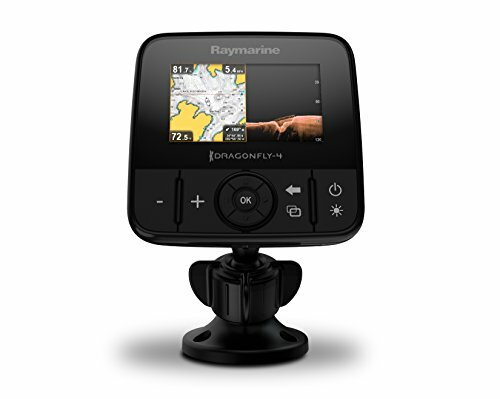 The Dragonfly 4PRO includes a dedicated GPS circuit and – unlike many other kayak-friendly fish finders in this price range – it is also compatible with Navionics charts and maps. It is very easy to mount the Dragonfly 4PRO thanks to its all-in-one, twist-lock cable that connects to the back of the unit. The Dragonfly 4PRO also features a very high-quality display screen, which, at 4.3-inches, is larger than any other screen in the under $300 category. The full-color screen produces incredibly detailed, crisp and clear images, and it is optically bonded so that it will never fog up, no matter the weather. For more detail, please read our complete Raymarine Dragonfly 4 Review. The Humminbird Fishin’ Buddy is an all-in-one fish finder designed specifically for kayaks and other non-traditional crafts. 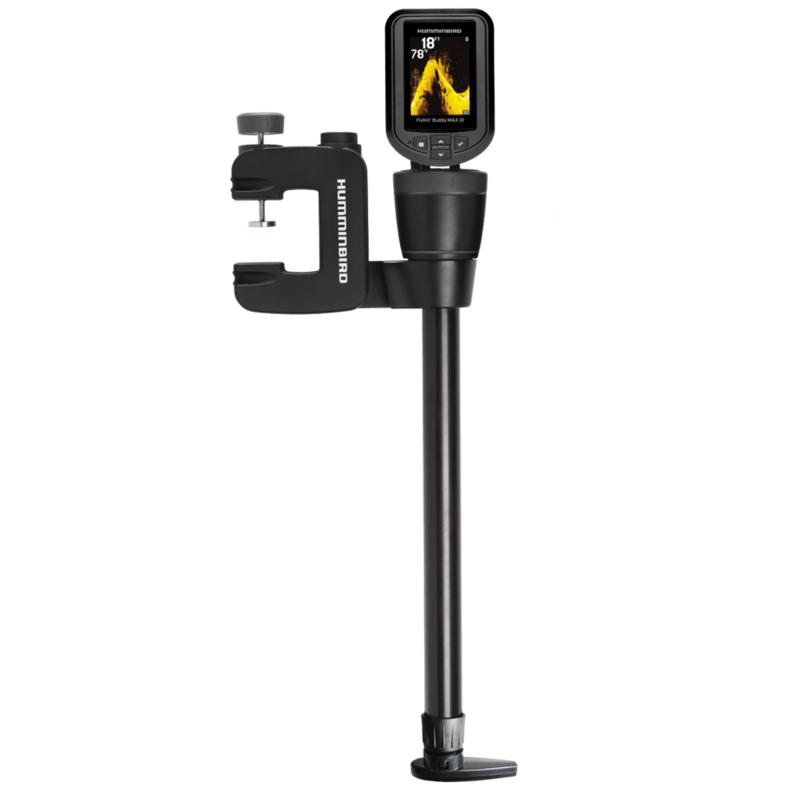 The Fishin’ Buddy features a display screen that is attached to the transducer via a telescoping pole (which adjusts from 24 to 40 inches in length). The pole has a clamp near the screen, which can be used to attach the fish finder to your kayak quickly and easily. The Humminbird Fishin’ Buddy is obviously easy to use and quite portable, but it also provides most of the features you’d want too. For example, it has a high-quality 3.5-inch, color display screen, and it even provides down-imaging capabilities, so that you can see plenty of detail. You can even activate the unit’s Selective Fish ID function, which will prevent you from having to interpret arcs; instead, you’ll just see fish icons on the screen. It works to depths of 600 feet when used in traditional mode, or 320 feet when using the down-imaging function. Several different alarms are included with the Humminbird Fishin’ Buddy, which can be turned on to warn you when different sized fish travel through the beam. It also displays your cruising or trolling speed, has 10 different sensitivity settings and comes with a very helpful zoom function. But despite all of the features and capabilities it provides, you won’t have to hook the Fishin’ Buddy up to a boat battery; eight AA batteries provide all of the juice it needs. A carrying case is also included with the Fishin’ Buddy, to ensure it remains safe when you travel. For more detail, please read FishingTech’s complete Humminbird Fishin’ Buddy Review. 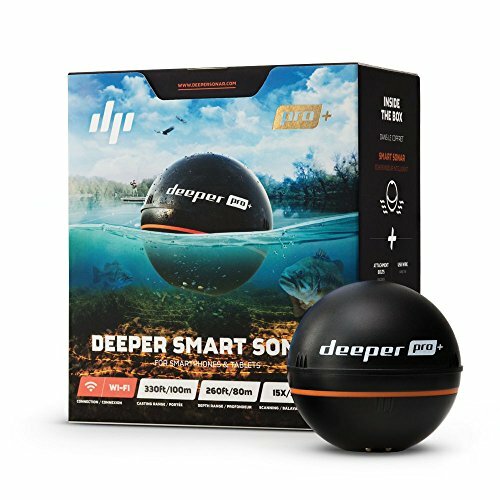 The Deeper Smart Sonar PRO+ is a castable fish finder, which enables you to peer into any waters within casting distance. This can be very useful when trying to catch fish along tree lines or other places you can’t directly access with your kayak. Additionally, it means you won’t have to go to the trouble of mounting a transducer on your transom – you could even keep this fish finder in your gear bag or tackle box. But while some castable fish finders are relatively poor-quality units that are essentially expensive toys, the Deeper Smart Sonar PRO+ performs as well as most traditional, transom-mounted units do. For example, it can probe depths of up to 260 feet, and it can identify and mark anything that is at least half an inch across. It allows you to identify sunken trees, vegetation, creek beds and other items, and it even displays the water temperature. Additionally, the Deeper Smart Sonar PRO+ is the only castable fish finder on the market that has GPS mapping capabilities. This allows you to make your own custom map of the local farm pond or creek, which you can then view and analyze on your computer. 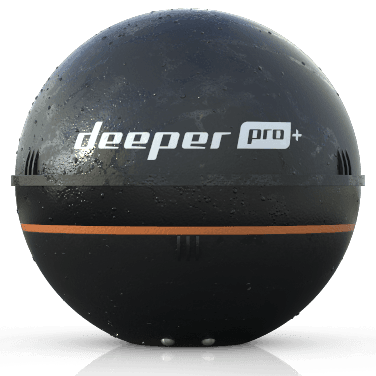 The Deeper Smart Sonar PRO+ doesn’t come with a display screen; instead, you’ll use it in conjunction with your smartphone or tablet. It connects to your device by using WIFI technology, which works anytime your phone is within 330 feet of the floating transducer. The transducer unit itself also features an optional flexible arm that will reach from a kayak’s accessory mounts to the surface. The option makes the PRO+ a true entrant into the kayak fish finder category. There’s no reason that kayakers can’t enjoy the same type of technology that those piloting traditional boats do. You just have to make sure that you select a kayak fish finder that will work well for you. Any of the fish finders detailed above should help you find and catch more fish, but you should certainly do your best to select one that will suit your specific needs. But we reviewed five different models for a reason: If none of the award-winning kayak fish finders below look like they will meet your needs, don’t hesitate to consider one of the other options we’ve covered. Each is sure to help you find more fish, learn more about the world beneath the surface, and give you a better time while you are fishing. Those who’re already familiar with fish finders and are looking for purchase a top-of-the-line model will be well served by the Raymarine Dragonfly 4PRO. Jam-packed with all of the things you’d want in a good kayak fish finder, including Navionics chart compatibility, down imaging and an optically bonded screen, the Dragonfly 4PRO will cost you a little bit more than some of the other options in our review, but it will surely help you to push your angling to new levels. Sometimes the best technology is common sense. Such is the philosophy that went into the creation of the Humminbird Fishin’ Buddy. In terms of sheer flexibility and portability, the use of an integrated clamp mount and functional design choice with extendable transducer pole nacelle mean that switching between kayaks and/or traditional fishing boats takes mere seconds, no transducer mounting or phone pairing. Even the use of AA batteries — which can be swapped out easily and can be as environmental as any if rechargeable batteries are used — screams battle-tested design. 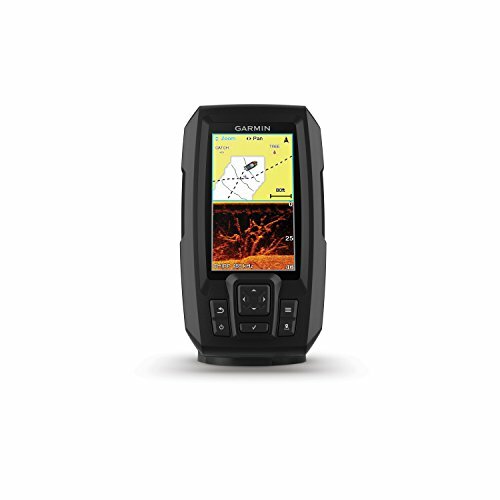 if you are new to fish finders and reluctant to spend a fortune on your first unit, the Garmin STRIKER 4cv is an excellent option, which will give you all of the major features you’d want at an affordable price. This not only includes GPS functionality and an excellent display screen but CHIRP down-imaging too. With Garmin’s solid reputation, it’s a safe bet for any budget.